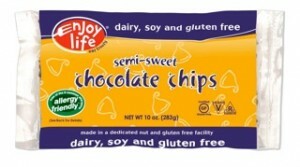 Enjoy Life Foods® is not a company unknown to most gluten-free consumers, but there were things about the company that I didn’t know. Enjoy Life Foods® (ELF) was founded in early 2001 with a purpose to support a product line free of gluten as well as the 8 most common allergens: wheat, dairy, peanuts, tree nuts, egg, soy, fish, and shellfish. With a purpose as star high as that, it took a bit of work to be able to deliver products palatable and delicious. I for one know what it’s like to try and bake without even half of the most common allergens—difficult! I personally taste-tested their soft-baked cookies, granolas, snack bars, chocolate chips, trail mixes, chocolate bars, and bagels. I’ve been using the chocolate chips for years and these are the most common chips I choose to use in my recipes and those listed on my website (http://glutenfreehelp.info). I never have physical troubles nor do my “allergic” friends with these chips. The granolas were fantastic and bursting with flavor. We also tested them as the base for our homemade trail mix and in granola cookies. The soft-baked cookies were moist, and we all agreed they were light in flavor, offered in a number of flavors. Most people do not know about the man behind all this, Scott Mandell. As part of a class assignment at the Northwestern University Kellogg School of Management, he came up with the notion that those with dietary restrictions sacrifice flavor and nutrition in foods. Scott and his team came up with a business plan with good nutrition and great taste for people on a restricted diet. In 2001, he raised money to build a dedicated GF facility to start his company and develop products. 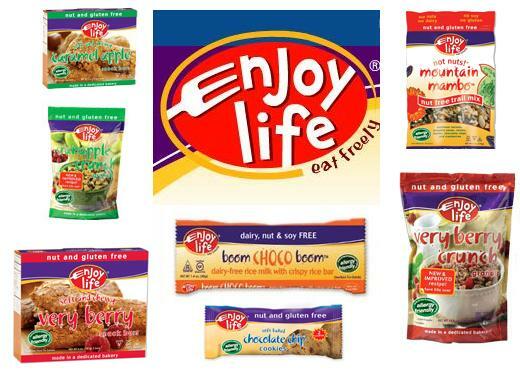 Enjoy Life Foods® has been named to Inc. Magazine’s 500/5000 List of Fastest Growing Private Companies for three years in a row from 2007 through 2009. Enjoy Life Foods® teamed up with Fair Winds Publishing to launch a GF allergy-friendly cookbook entitled, Cookies for Everyone! You can be assured of allergy-free cookies, brownies and bars that are safe and delicious. 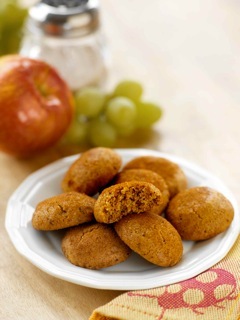 Each of the 150 recipes are gluten-free and allergy-friendly (NO: wheat, dairy, peanuts, tree nuts, egg or soy). All readers will also learn how to use naturally allergy-free ingredients and substitutes to add extra richness, texture and nutritional content to any cookies and bars without losing the taste. This is a company that cares and is doing something about the growing needs of celiac and allergic individuals. They already have another book planned to be released in January, Cupcakes and Sweet Treats. Thanks Tina! Haven’t heard of them, but I’ll definitely check them out! Cool brand! I like the videos. 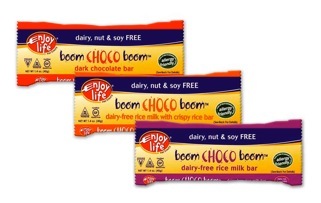 Happy to see there are products, with chocolate no less, that are free of so many common allergens. Oh boy. Look delicious. I’ve been looking for some good GF chocolate chips! I am always so pleased to hear about companies who are looking out for the allergic communities. I’ll be supporting this company! Can’t wait to try the chocolate bars! Yummy! Oh boy, chocolate!!!!! I’m adding this to the grocery list for sure! I’m very excited to try this brand. Thank you very much, Tina! Thanks so much for sharing this company. I am going to try their chocolate products. Very excited to see what they’re like! Thanks Tina I love the videos! Thanks for featuring this company. I look forward to trying their products. My son at 9 years old is vastly different from most children with his “health nut” mentality, so Enjoy Life’s snickerdoodles and other cookies really come in handy when it’s treat time… love these products. Enjoy Life Trail Mix is hands down the perfect complement to yogurt… I almost wanna leave the house to buy some now! Terrific review. Incredible cereals from this company – not overloaded with sugar and doesn’t leave you feeling heavy afterwards. Bonus is that my kids like the cereal too! Great company and great review… I recall one time on a hiking trip that I needed a quick bit of energy and the sunbutter crunch bar really gave me that last bit of energy that I needed on my trek. Really good power food. The Caramel apple has a very good apple cinnamon taste! The yogurt and blueberry taste is quite good in the Very berry! The Gingerbread spice is right on target! The Double chocolate Brownie is really tasty. It has a light brownie flavor. The Cinnamon crunch is perhaps my favorite. Overall, enjoy life has one a great job of finding tasty gluten free substitutes. The Sunbutter crunch taste like peanut butter. The Caramel apple is yum, light and zesty. I can really taste the raspberry in the Very berry. The Gingerbread spice is like a good gingerbread cookie. The Lively lemon is really zest tasting. I would go on hikes with The Mountain mambo. The Beach bush is good for the beach. I think this company is a good choice for a little snack or breakfast. The Sun butter crunch is very peanut buttery. The Caramel apple is very yummy! Taste like apple pie. You can really taste the berries in the Very berry. The Cocoa loco is yummier than I remember. Good coco taste. The Gingerbread spice is mmm! So delish! The Lemon is pretty yummy, a little too sweet but good. I like the apple taste in the Happy apple. The Snickerdoodle is my fav flavor! So yummy. I really like the Choco chip flavor! It’s so soft and delish. The No oat oatmeal is pretty good..it’s almost like there’s oatmeal! The double chocolate brownie is super good! Love the fudgy taste. The Mountain mambo is very tasty! Good for hikes. The Cinnamon crunch is great for breakfast. This Company makes great cookies and granola. I love them! The Happy apple is moist and tasty. Crunchy rice: snap crackle pop! Enjoy Life has good alternatives to mainstream taste in a “healthy” format. Could really complete with fruit/milk very breakfast/snack orientated.